On our second day of vacation we spent the day cage diving with Great White Sharks off of the coast of Gansbaai in South Africa. Gansbaai is about a two hour drive from Cape Town so it was a bit of a hike after spending 21 hours on a plane over the two days before but my wife and I were both looking forward to it so we decided we had to do it regardless of how ‘painful’ the extra travel might be. We booked the afternoon trip (11 AM pick up) to allow us the chance to sleep in and get our body clocks back on schedule. The boat trip was nice but we were giddy with anticipation as we approached the dive sight. 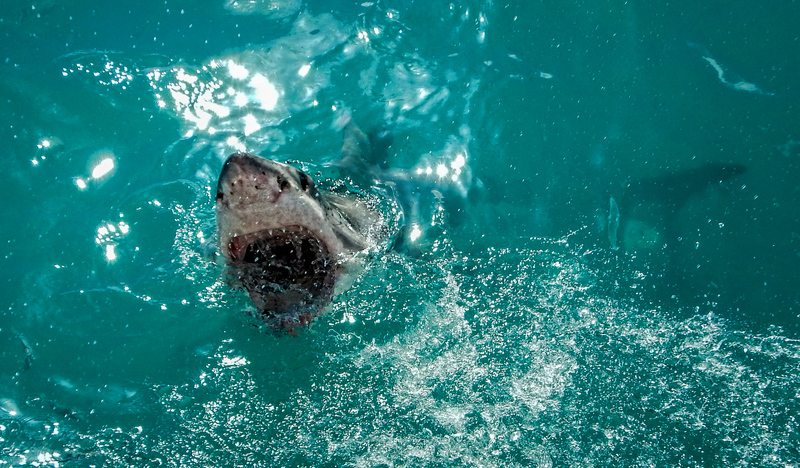 As the crew churned the water we saw the sharks start to swarm and several (like this one) even lunged out of the water to make an effort at the seal looking lure they were dragging in the water. Ultimately, when we got into the cage we wished we were back on top since the visibility in the water was so poor (only six feet or so) which meant unless the shark was directly in front of your face you didn’t see much of anything. During the course of the day we saw about ten sharks – ranging in length from 2 to 4 meters (~13 feet) which is about half their fully grown adult size. I think this one was right around ten feet and he moved so effortlessly in the water. It was truly amazing to watch.